Life, Literature, Laughter...: Review: BEAR & HARE: WHERE'S BEAR? Review: BEAR & HARE: WHERE'S BEAR? 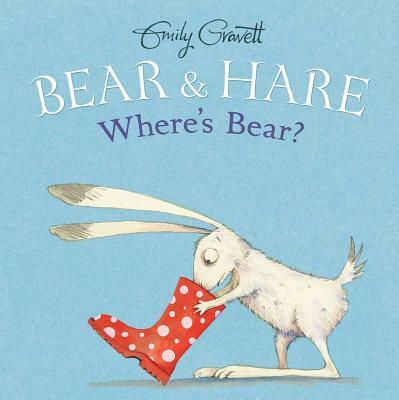 Emily Gravett has done it again! She has written a DELIGHTFUL book and an easy hand sell (and my bookselling persona thanks her for that). Bear and Hare are back and in this book they're playing Hide and Seek. Bear hides first and Hare gleefully counts to ten, with brightly colored (wait, coloured, since Gravett is British) numerals dancing across the page. Bear is easily found hiding behind a thin floor lamp, a stack of books (this would DEFINITELY have worked in my house, I could hide an ELEPHANT and still have books left over) and an aquarium. Bear goes looking for Hare next and cannot find him anywhere, but then Bear disappears! Hare looks frantically for him to no avail. What will happen?!?!?!? What makes the book more fun are all the little visual jokes and nods to literature that Gravett puts in. The end papers (always look at picture books' end papers, they are often delightful and sometimes part of the story) show Hare in 'search mode' in the front and Bear searching on the back end papers. There are also numerous images of goldfish, in the aquarium (duh), on the lampshade, on the spine of a book. I wonder if they're alluding to Gravett's next book. This resource discusses book reviews and how to write them. This is a wonderful book for kids to learn perseverance. To take personal statement writing help you can visit here. Thanks for sharing nice book information which should helpful for students. Each undertaking which is begun inside the nation must offer points of interest to that nation and its administration. This article is about some adhaar task of India and through this https://www.besttranslationservices.com/personal-japanese-english-translator/ we figure out how India has experience a few issues by this undertaking. A few people are dependably against such undertakings which they censured for the most part. This http://www.radiologyfellowship.net/radiology-personal-statement-services/diagnostic-radiography/ particular source talks about guide evaluations as well as how you can create all of them. This can be a fantastic guide with regard to children to understand determination. It is really good news for the medical student as there has a chance for them to get a job and look forward to the future. http://www.manualwriting.net/our-manual-writing-services/help-with-writing-an-operations-manual/ that helps me a lot on my academic papers writing. In the event that you have well learning and data about the use of your insight and data then you can utilize it in great behavior and you can upgrade your insight in regards to a theme. We are ideas here for your any sort of assistance in your instructive works, get in touch with us.